Olympic National Park. It becomes clear why this park is also protected as an International Biosphere Reserve and a World Heritage Site. 73 miles of wild Pacific coastline constitutes the coastal element of Olympic National Park. The beaches are quite varied with beaches of sand, assorted rocks, bushes, boulders, arches, bogs, tide pools, forests, sea stacks, and sheer cliffs. Stretches of intact coastal wilderness as long as 20 miles are still standing, literally unchanged by man. A handful of the last remaining wilderness beaches in the lower 48 states are between the Hoh River and Shi Shi Beach. Native communities rest in the mouths of the Hoh River and the Quileute River in the coastal region. The prevailing hike in this area is the leisurely 9 mile Ozette Loop that wraps around a coastal cedar swamp. This hike can be broken into thirds for those who want to shorten their hike. Boardwalks make the hike simple but they can be slippery when wet. Always bring a tide chart and a map when hiking along the coast. Look carefully for petroglyphs on the Cape Alava portion of the Ozette Loop hike. Many of the beaches have huge driftwood logs that have migrated down rivers, eroded smooth in the ocean where they end up above the surf line. Japanese glass net buoys can be spotted among the driftwood and flotsam and jetsam. It takes a full year for the glass bulbs to reach the American coast. 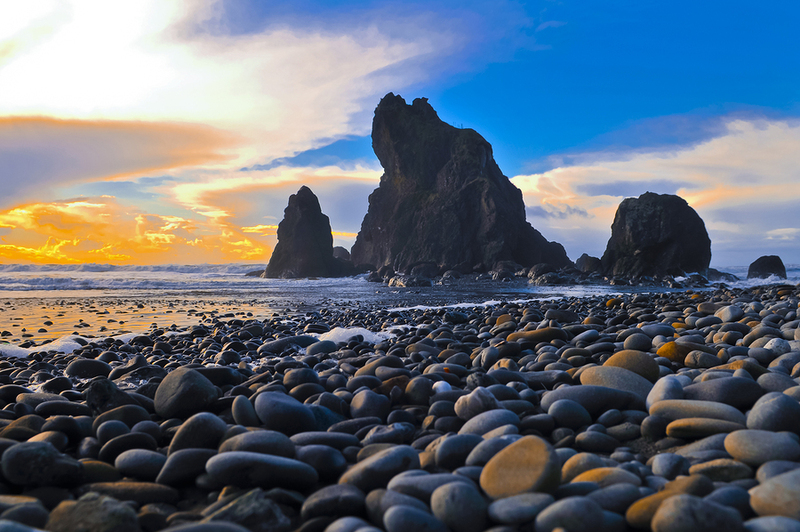 Cape Alava is known for being one of the top places to view marine mammals on the Pacific Coast and is the most northwesterly point in the contiguous United States. While exploring the beach, taking items you find is strongly frowned upon. 29 whale, dolphin and porpoise species pass through the neighboring waters of the coastal stretch of Olympic National Park. Bald eagles, snowy plovers, and many more birds are found here. Seabird colonies on the Olympic Peninsula are some of the largest in the United States. Neighboring Olympic National Park's coastal region is the Olympic Coast National Marine Sanctuary that includes over 600 islands that are crucial habitat for both marine mammals and birds. Look closely in the receding waters, you will see many footprints from mostly birds, but also deer, bear, river otters, and raccoons among others. Between the wild coastline and the heights of the Olympic Mountains are portions of temperate rainforest that are so vibrant and green that you will feel like you have entered the jungle. There are four rainforest areas in Olympic National Park: the Hoh, Quinault, Queets, and Bogachiel valleys. These areas experience lavish precipitation from 12 to 14 feet of rain per year. In the off-season, the fog gives the forest the precipitation it needs. The temperature stays between the extremes rarely falling below freezing or above 80 degrees Fahrenheit. Temperate rainforest used to be abundant and stretch from Oregon to southern Alaska. The Olympic Peninsula rainforests benefit from shelter from storms provided by the mountains to the east. Sitka spruce is the dominant tree in the temperate rainforest as well as western hemlock. They can grow to mondo sizes, as high as 300 feet and up to 23 feet around. Secondary trees are western redcedar, red alder, coast Douglas fir, bigleaf maple, black cottonwood, and vine maple. Living plants take up almost all of the space in the rainforest. Air plants, called epiphytes, live upon other plants in a non-parasitic way and drape down from branches. The ground of the rainforest is carpeted with ferns, sorrel, moss, and lichens. The ground cover is a dense carpet of greenery. This makes it difficult for tree seedlings to take root. A common rainforest phenomenon occurs when seeds germinate on a decaying tree all in a row. Over time, the log rots away and left over will be a row of adolescent trees standing on the tippy-toes of their levitated roots. The compact vegetation serves as a protective habitat for rainforest animals. Herds of Roosevelt elk, black-tailed deer, black bear, mountain lion, river otter, jumping mouse, Douglas squirrel and shrews all make their home in the rainforests of Olympic National Park as well as some reptiles, amphibians and many insects. Luckily, there are no poisonous snakes in the region. Birds that live in the rainforests are western robin, thrush, pileated woodpecker, northern spotted owl, winter wren, junco, gray jay, raven and of course many more. The Olympic Mountains are unique as far as mountains go. They rise almost 8,000 feet in 40 miles from the seashore. The heavy precipitation that the northwest is known for comes from moisture-laden air that reaches the coast and dumps up to 200 inches of rain at the skirts of the Olympic Mountains per year. At higher elevations, the precipitation falls as snow and supplements the many glaciers in the Olympic Mountains. The east side of this mountain range gets as little as 17 inches of rain due to a distinct rain shadow phenomenon. There are four types of forest in the park; temperate rainforest, lowland, montane and subalpine. In the vaporous river valleys on the western side of the Olympic Mountains are the temperate old growth rainforests. Much of the Olympic Mountains region is covered in old growth forest of varying types. Above the rainforest, the lowland forest also is riddled with old growth without Sitka spruce but still seeing western hemlock dominate. In the arid eastern lowland forest, within the rain shadow, Douglas-fir prevails. As you climb past the lowland forests and you can no longer find any of the dispersed western redcedar trees, you know that you'll have reached the montane forest level. The montane level is often more difficult to identify, but it represents the area of the mountain where the clouds linger. The dry east side of the mountains might not show a lot of difference between lowland and montane forests except for the lack of western redcedar. Above the montane region, with higher elevations and cooler temperatures, things change. The heavy precipitation mostly turns to snow and feeds the Olympic National Park glaciers that feed the waterways in the spring and summer. At this subalpine level, growing seasons are shorter and there are fewer trees, shorter trees and they are often misshapen from the elements. Trees up here look a lot different than in lower elevations, where a tree as old as 100 years might only reach three feet tall. In this zone, silver fir grows, as well as the lower montane region. If you see mountain hemlock, subalpine fir or Alaska cedar, you can be sure that you have reached the subalpine zone. This is the area where the tree vegetation thins out and meadows unfold with delicate alpine wildflowers amongst aqua-colored glacial lakes. The wildflowers continue on above treeline where trees no longer grow. Mt. Olympus is a staggering 7,965 feet tall and has the most glaciation for a non-volcanic mountain peak in the lower 48 (aside from the north cascades) with 6,400 acres of glaciers on Mt. Olympus alone. The Hoh Glacier is the biggest in the park at over 3 miles long out of over 260 total glaciers. Olympic National Park glaciers are still actively carving the landscape, although slowly. The glaciers, surprisingly are not receding rapidly, either. Past glacial movements have created U-shaped valleys, lake basins, and rugged peaks, as well as the Strait of Juan de Fuca and the Puget Sound. This glaciation isolated the Olympic Mountains from the surrounding landmasses. The Blue Glacier and the Anderson Glacier are the most visited in the park. The Blue Glacier can be reached by way of an 18-mile trail beginning at the Hoh Rainforest. Anderson Glacier access is reached via eleven miles of the Dosewallips River Trail or by a sixteen-mile trek from the East Fork of the Quinault River. Be advised that glacier exploration is a dangerous endeavor and should never be attempted alone or without the proper tools, such as climbing rope, crampons, and an ice ax. Ice climbing with an experienced leader is ideal. 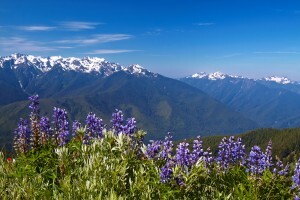 The Olympic Mountains' geographic isolation from other mountain ranges and landmasses has created a unique development of genetic diversification. The Olympic marmot is a good example of isolated development where it embodies distinctive behavioral and chromosomal sequences. 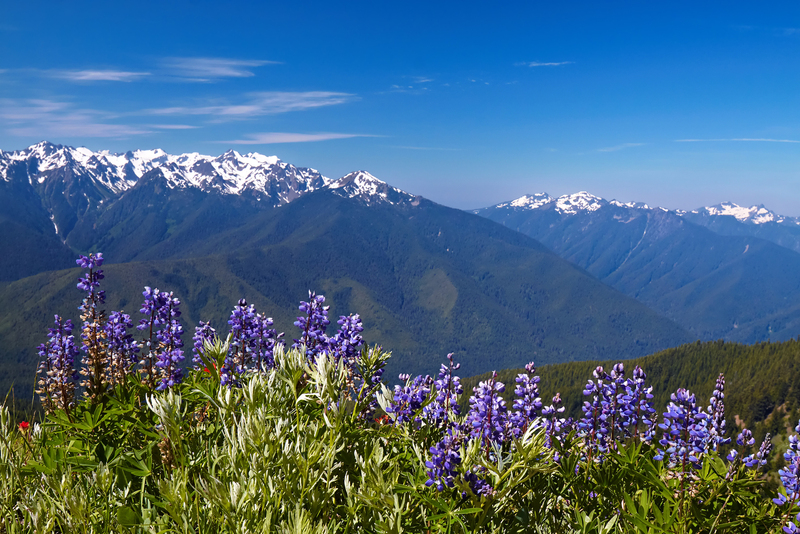 Other examples are Piper's bellflower, Olympic snow mole, Olympic Mountain Synthyris, Flett's violet, Beardslee trout, Crescenti trout, Olympic chipmunk, and more. Olympic National Park enjoyed over 4 million visitors in 2009. The most popular time to visit the park is July through September. The offseason is a good opportunity to avoid the company of other visitors. Many just pass through in their vehicles, but there are several activities and attractions if you want to stick around for a few days. Expansive trails, camping, fishing, scenic roads, whitewater paddling, sea kayaking, and winter activities, too. Hurricane Ridge is a favorite destination in the winter months due to a not for profit alpine and Nordic ski hill. Nearby wildlife refuges and Native American villages add more opportunities for excitement and culture. Eight tribes still reside along the shores of the Olympic Peninsula following the same pathways and hunting/fishing migrations of their ancestors.